Operator, won’t you help me replace this call? 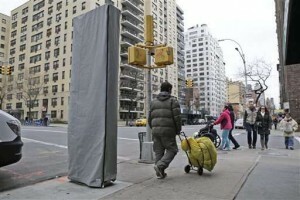 A 9-foot-tall, narrow structure installed this past week on a Manhattan sidewalk is signaling a plan to turn payphones into what’s billed as the world’s biggest and fastest municipal Wi-Fi network. With some cities nationwide making renewed pushes for public Wi-Fi after an earlier wave of enthusiasm faded, New York officials say their project is democratizing data access while modernizing outmoded street phones.